It would be all too easy to write-off Chrome Hoof as a bit of a novelty act and the sort of band that would be a veritable hoot on a festival bill but a little too eccentric and contrived in practice to be much of a prospect on record. 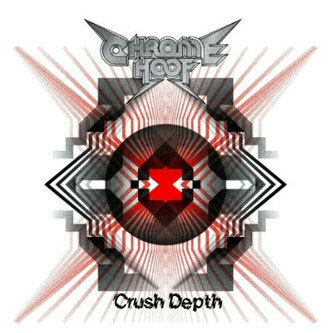 Crush Depth proves there's more to this lot than spangly space armour and tongue-in-cheek collisions of doom metal and disco culture. 'Crystalline', the album's first song proper, opens up proceedings with a suitably unlikely concoction that swills together dramatically-charged horns and violins with the charismatic vocal of Lola Olafsoye - who also sings for Spektrum. Consolidating this formula into a yet more theatrical package, 'Labyrinth' introduces a quickened up disco backbeat and a perplexing West End musical feel, but all the incongruities slip away for the splendid electro-prog-funk of tracks like 'Deadly Pressure', 'Sea Hornet' and 'Vapourise' which nicely capitalise on the group's dancefloor plundering potential. At the more epic, metallic end of the band's output you get immense operatic numbers like eleven-minuter, 'Witches Instruments And Furnaces' and the punishing riff developments of 'Third Sun Descendent', which is quite tremendous.